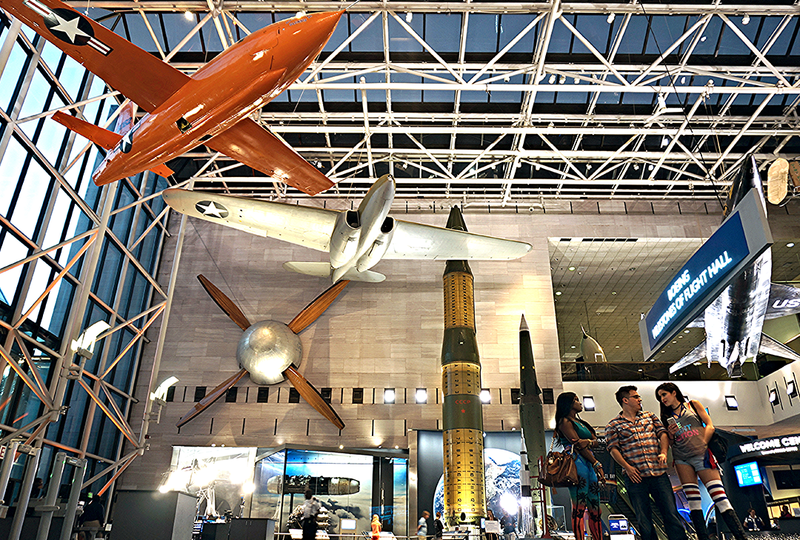 The National Air and Space Museum maintains the world’s largest collection of historic aircraft and spacecraft. It is also a vital center for historical research on aviation and spaceflight and related science and technology, and home to the Center for Earth and Planetary Studies, which performs original research. The flagship building on the National Mall in Washington, D.C., houses many of the icons of flight, including the original 1903 Wright Flyer, Charles Lindbergh’s Spirit of St. Louis, Chuck Yeager’s Bell X-1, John Glenn’s Friendship 7 spacecraft, and a lunar rock sample that visitors can touch. The museum’s Steven F. Udvar-Hazy Center, in Chantilly, Virginia, houses many more artifacts in an open, hangar-like setting, including a Lockheed SR-71 Blackbird, and space shuttle Discovery.